Beth of Smiling to Life / BetulaWorldpress shares the most amazing images on a daily basis, and her work always inspires me. She graciously gave me permission to try and render one of her beautiful photos, which can be found at this link. Her work is also for sale at this link, and I encourage you to visit her shop. You’re sure to find something beautiful every single time. Her florals in particular always move me, and sometimes I’m able to get a sense of them on the page. Neocolors to the rescue once again! The next two weeks are probably my busiest in the whole year, so I may be posting sporadically for awhile. Hoping to catch up with all of you soon. It’s Friday! Are we dancing? You bet! Tailfeathers all a-twitch over here. Peace. < Turn Tuesday on its Head! Once again the neos didn’t let you down – so vibrant and full of life! Indeed Beth takes glorious photos and I especially am amazed with her macro shots. Good luck the next few weeks, and have a terrific weekend, Laura! Thanks, Carol! And you the same! So glad you are enjoying Beth’s work. She is amazing! This looks like a piece of blown glass. I love it! Thank you so much Laura; I am honouted…I like your work, very nice!!! Great, thank you, Beth! And thanks for sharing your gorgeous work with us! dancing with that flower in mind! beautiful! 🙂 Don’t work toooo hard! I guess I should get my taxes done – ugh! ugh is right lol! I’m having fun with them this year, but mine….not so much hehe. Perfect use of neos, very vibrant! Very Nice 🙂 Her photos are just incredible. Thanks so much, Snehal! I’ll still be around, just not every day. I’m making art every day, and that’s the most important thing. Blogging is nice but, a luxury right now time-wise. Thanks, Jill! Loving your flowers too my friend! Luscious color! Thanks for brightening my day Laura! All is well Laura! Your posts are happy surprises! 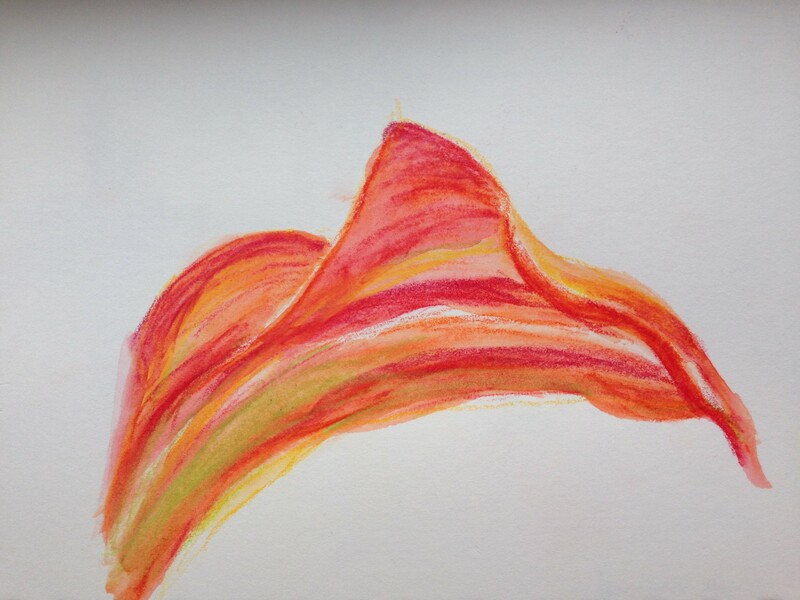 Lovely and graceful Laura – a nice burst of color for the Calla! I understand about being busy, been unable to spend time on my blog or visiting others – hope to catch up very soon. Have a great weekend. Stunning colors in this!! Lovely Laura! 😃💜Wishing you the best during your busy schedule!! Oh, Denis! What a wonderful image that conjures. Thank you so much for sharing. I hope you’re sketching has begun? Getting there, thinking about it!!!!! Laura. I also ordered The Drawing on the Right Side of the Brain Starter Kit you recommended from Abe books in Britain, so maybe I’ll wait till it arrives. Oh, Denis. You’re in for the journey of a lifetime, pal. I’m so excited for you! I love callas! Beautiful colors! Oh those velvety neocolors, delicious! Don’t let the season “tax” you too much – glad to see you’re taking time out to paint. I love calla! I brought some seeds here to FL from PA and we have some already growing on the property – not in bloom yet, though. Your abstraction is super cool. Love that red!